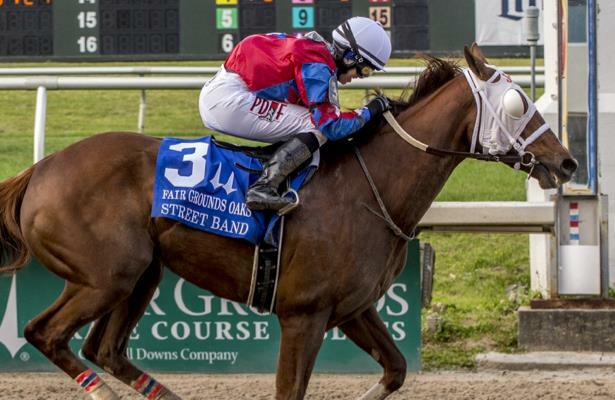 Believe You Can, I’m a Chatterbox and now Street Band – all Larry Jones-trained fillies who used victories in the Grade 2, $400,000 Fair Grounds Oaks as a springboard to a bigger spot on the first Friday in May. Street Band’s way to a win and a Kentucky Oaks spot opened up when odds-on favorite Serengeti Empress faded from the lead in Saturday’s 3-year-old fillies feature. As expected, Serengeti Empress was quick to the front and set fractions of 24.12 and 47.48. But jockey James Graham pulled her up after the field turned for home and she was vanned off. Tom Amoss, who trains Serengeti Empress, the last out Grade 2 winner, reported she bled during the race. She is otherwise “fine and comfortable at the barn,” Amoss said. With Serengeti Empress headed the wrong way, the 10-1 shot Street Band ran down the center of Fair Grounds’ stretch and completed 1 1/16 miles in 1:44.54 under jockey Sophie Doyle to take her second-ever stakes start. Steet Band was fourth behind Serengeti Empress last out in the Rachel Alexandra (G2), but pulled away to a 3 3/4-length win Saturday. Jones and his wife, Cindy, bred and campaign the Istan filly in partnership with Ray Frances. She has now won three times in eight career starts and earned $310,325. With the Fair Grounds Oaks the first prep to award points on a 100-40-20-10 scale to the first four finishers, Street Band rocketed to the top of the Kentucky Oaks leaderboard. Liora, who first headed Serengeti Empress through the turn, wound up second. She was also second in the Rachel Alexandra two starts after upsetting Grade 1 winner Restless Rider in the Golden Rod (G2) at Churchill Downs. Another two lengths back, Sweet Diane was third and Eres Tu fourth.